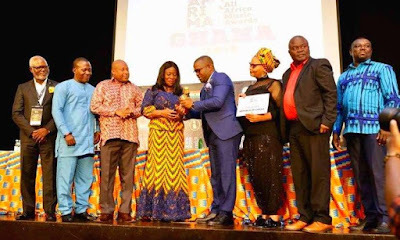 Ghana has been officially unveiled as host of the 2018 All Africa Music Awards. AFRIMA 2018 will take place in Ghana. The news of the move from Nigeria to Ghana had been reported. But the news had come without an official launch – until yesterday 18 September at a ceremony held at Accra's Kempinski hotel. Reggae-dancehall act Stonebwoy expressed enthusiasm at the event's appearance in Ghana. "We’re happy that AFRIMA is here and Ghana is going to host the prestigious award scheme for 3years and we’re grateful," he said. At the event, the award scheme's president Mike Dada said the purpose of AFRIMA is to serve as a communication tool. "The AFRIMA program of events provides the opportunity for Ghana to showcase the unique artistic, tourism and economic potentials of her culturally dynamic and beautiful cities. "The program goes further to offer benefits that would help in raising the continental and international profile of the Host Country, including an opportunity to tap into the millions of participants and followers of the growing African music." Ghana's Minister of Tourism, Arts and Culture, Catherine Afeku, said her country will use the hosting to its advantage. "We are ready to take Africa by storm," she said. "The narrative of Africa must change, and changed through music. We can use music as a conduit for peace; we can use music to send a strong signal to the rest of the world... that our young people are talented, intelligent and the hope for the next generation." "We no longer want to offer the justification for those who want to be rude and abusive about Africa and her peoples. It is time to build our economies that are not dependent on charity and handouts. We have learnt from long and bitter experience that, no matter how generous the charity, we would remain and, indeed, we have remained poor." "Let us in November carry the message of Ghana Beyond Aid message through music. I entreat each and every one of you to be an advocate of Africa."